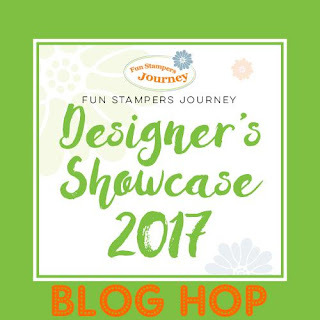 Welcome to the first ever Designer’s Showcase Blog Hop! What is the Designer’s Showcase? We are a team of ten Journey Coaches from all over the country. Fun Stampers Journey hand selected this group of coaches based on hand stamped submissions that we all sent in. 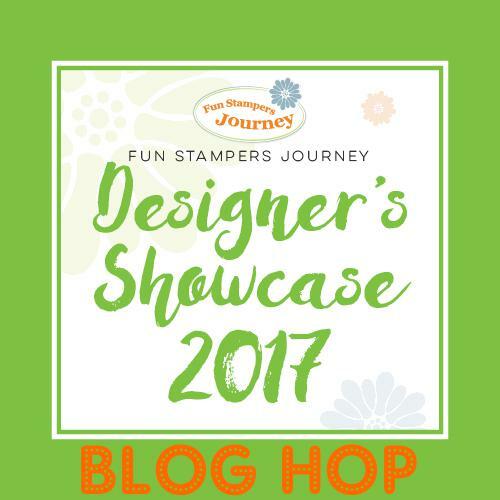 Our goal is to showcase the amazing products that Fun Stampers Journey has to offer and inspire you to create. If you want to follow along in the blog hop you will find a link below to go on to the next Coach’s blog or facebook page. 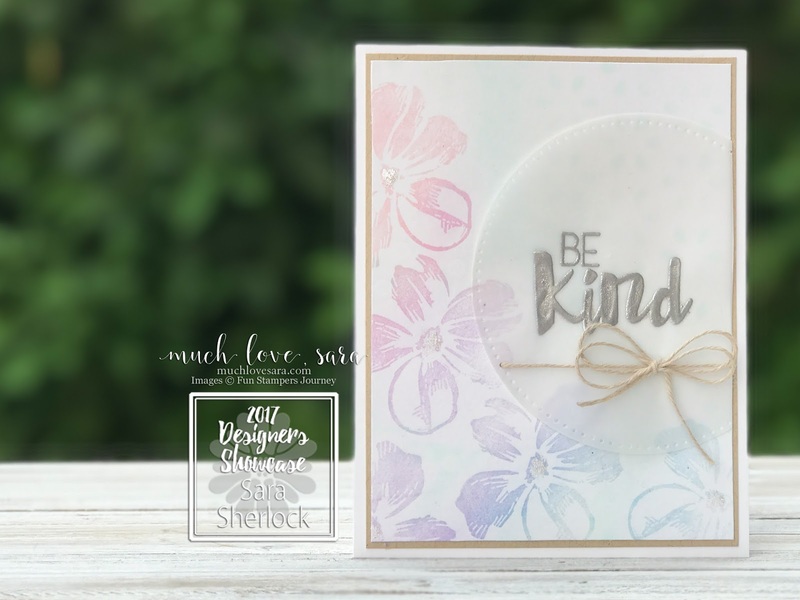 And at each blog you will find a link to the next, so you can see all of our creations and get to know the 2017-2018 Designer’s Showcase team. My name is Sara Sherlock. I'm a wife, step mom, and Nana to a brood of grands (and I'm still only in my thirties - for a few more months at least! ), and a bit of a crafty nerd. I love to try new things, and if something sparks my interest - I jump in with both feet. Card making has been a passion of mine for nearly 6 years now. I love to create, and share, both my creations, and the techniques I learn and use along the way. I'm a strong believer that EVERYONE is creative - you just have to find your medium. 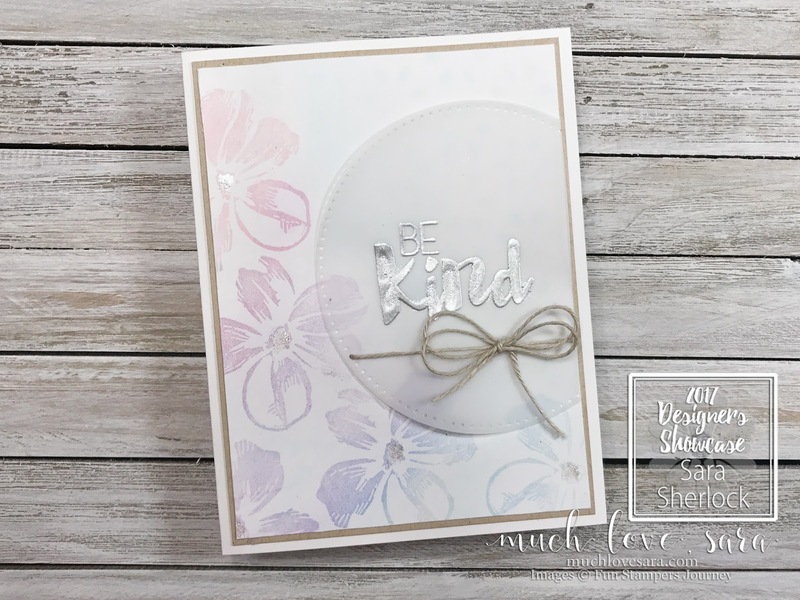 I am a recent addition to the Fun Stampers Journey family, having joined this past June, but I adore the variety of products and camaraderie of the coaches that I have found within this company. On to the good stuff - my project! Every time I hear the word "kind", a certain tune pops into my head. When I was a child, my sister and I frequently had the usual sibling tiffs. My mom took singing this children's song from church when we would start arguing, as a way to get us to stop. Often it worked, if only because we'd become more annoyed at the song, than we were with each other. But it did stick in my head - particularly the final line. For my card today, I wanted to use some of the GORGEOUS Pan Pastels that are on sale this month as part of the Media Mix Promotion. I chose to stick to the Confectionery Days set (all products will be linked at the bottom of this post). "For that is right, you see. I stamped my flower images in clear pigment ink, and then lightly brushed across them with my pink, purple and blue pastels. I used a VERY light touch, so that the pigment only adhered to the wet ink, and not to the Whip Cream card stock the images were stamped on. Then I filled in the background with the pool color of Pan Pastel, and also used a stencil in the upper right corner to "fade out" the pool color (click on the photo to bring up a larger version and see this effect). Then, I die cut a circle from vellum, and heat embossed my sentiment in an off set position. I glued that down by dotting glue behind the sentiment, and then trimmed the excess vellum off the edge of my card front. Using my Bloom Tool, I poked a hole in the card front, that corresponded with one of the holes in the edge of the vellum circle. I fed a piece of journey twine through the hole, so that I could add a double bow. 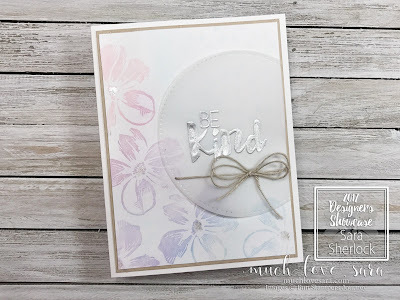 I finished out the card, by brushing some sparkle silk in the center of the flowers, as well as on top of the "kind" in my sentiment. "Kindness begins with me.' "
Is that song stuck in your head now? I know I'll be singing it for the next day or two. 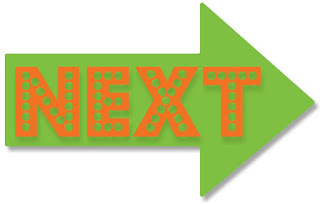 Next up you are headed to Melina's Facebook page, The Crafty Paper Princess. You are going to love her amazing projects! Be sure leave some comment love on the projects that you see along the hop. Angie Valle-Peteres: NOT HOPPING DUE TO HURRICANE IRMA Praying for your safety Angie! PS. 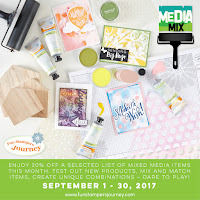 Don't forget that in the month of September, Media products, such as the Pan Pastels and stencil I used above, are on sale for 20% off. Stock up on paints, Pan Pastels, a Gel Press, brayer, and more until September 30th! Beautiful card Sara, and I love your clean crisp photos of your project! So glad that we get to be on the Designer's Showcase together! Such a soft and light airy feel to this card, love it! Love this card. 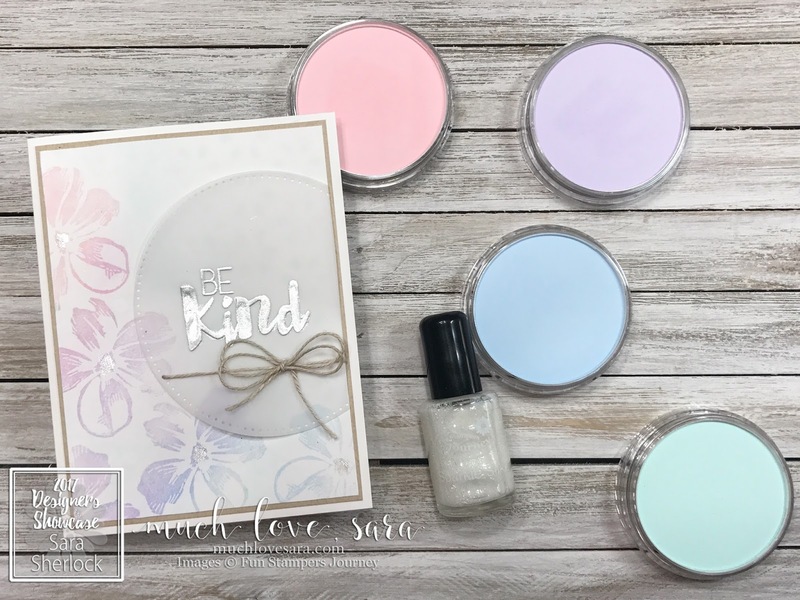 The vellum is perfect for your soft colors. I now have this song in my mind to my own tune! (need to look up...) GREAT presentation! Pastels are pretty. Also like that you actually listed your Platinum Machine as part of your tools. This is beautiful! You must have the touch of a butterfly, I would probably get PP all over my cardstock!! Great job. Stunning! I just got my first pan pastels today and will definitely be trying this technique. Gorgeous totally my style and I just got my first pan pastels in yesterday! I am in LOVE!!! Beautifully done!